It's very easy to get your hands on a good cake. These days, a store-bought cake or even one made from boxed cake mix will usually be pretty good. Heck, make the first simple recipe you find on the internet, and it's likely to taste fine. A great cake, however, is a little harder to come by—but completely worth the effort. In my opinion, there are two ways to get a great cake: spend a lot of money at a high-end bakery, or learn how to elevate your homemade cakes for less money and with a tad bit more effort. These are my five favorite tips for taking your home-baked cakes to the next level so you don't have to throw down a lot of spend to get rave reviews. There are a few ingredients that professional bakers use frequently but which aren't very common in most kitchens. The three I always turn to really do make a world of difference. 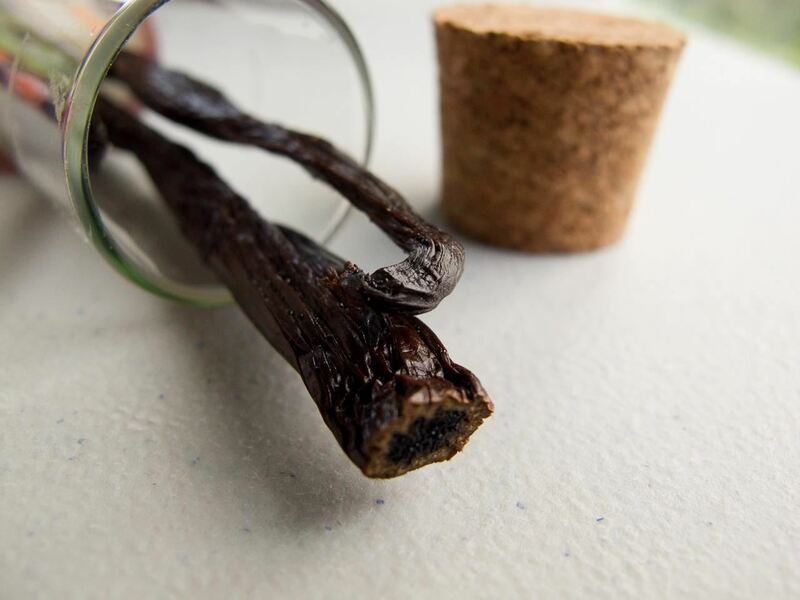 First, use the seeds of whole vanilla beans in place of vanilla extract in your frosting. Simply extract the seeds by cutting the bean in half lengthwise, then scraping out the seeds with the back of a knife. The vanilla bean seeds in your frosting will provide a much more intense vanilla flavor. Second, in your actual batter, use clear vanilla extract in place of normal vanilla extract. I always use clear vanilla extract in my non-chocolate cake batters, because it helps your cake maintain a perfect white color. It's important to make sure that you buy clear vanilla extract and not imitation vanilla, which is also clear (but not nearly as delicious). It can be hard to find actual clear vanilla extract, but it's available online and in baking stores. Third, add a tablespoon of milk powder to your cake batter to get a creamier, moister cake. You might think you could get the same effect by adding milk to your wet ingredients when making cake, but then you have to recalculate the amount of wet-to-dry ingredients in your whole recipe. This is a whole lot easier, and a whole lot less math-y. 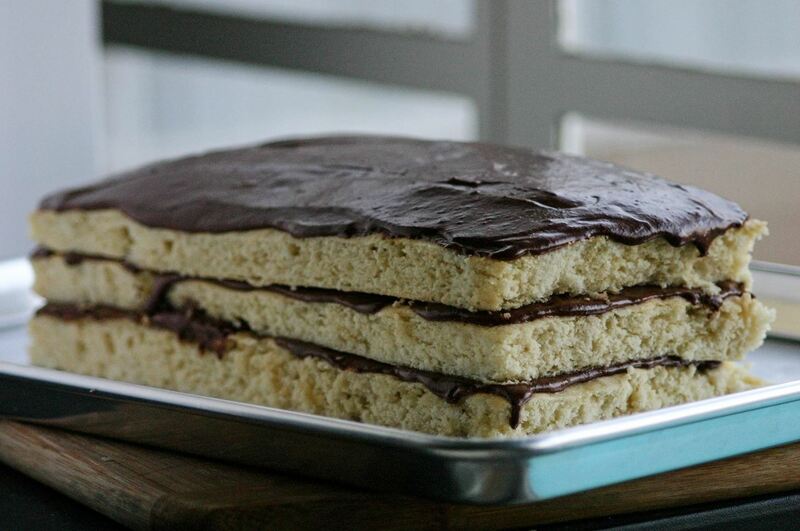 One of the most common problems that occurs when baking a layered cake is tenting. Tenting is when the cake rises in the middle so that the center is higher than the sides. When several layers of such a cake are placed on top of each other, the result is an uneven cake with a hump in the center. And when you cut the cake, each slice will look like it's pointing upwards. Not good. 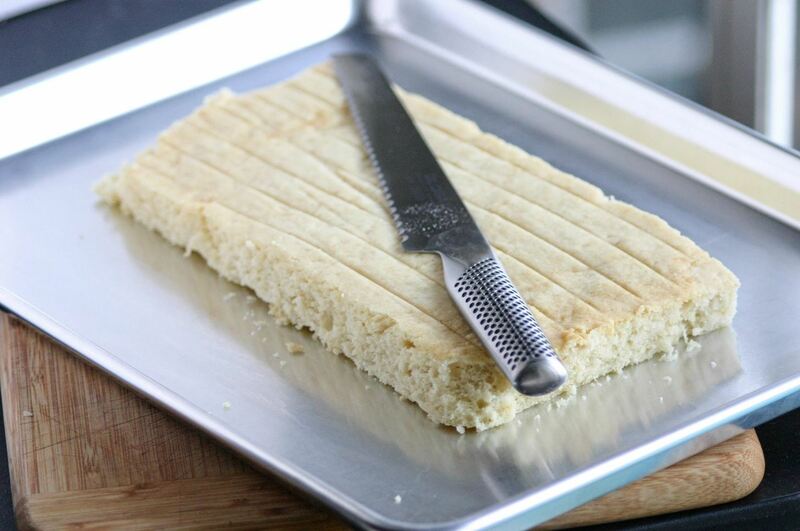 To keep this from happening, use a bread knife to shave the top of each layer off so that the layers are flat and even. Dental floss can also work for this, if you have a steady enough hand. People tend to think that every layer of their cake needs to be picture-perfect. Nonsense! 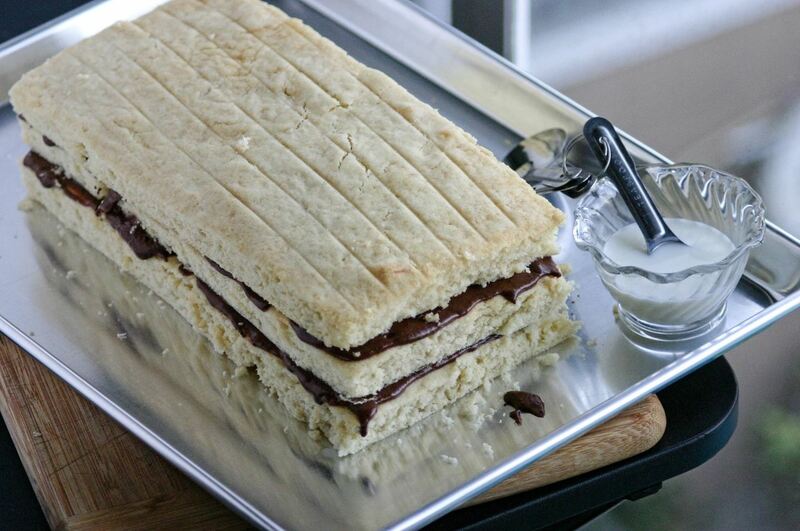 A little-known bakery trick is to hide your scraps in the middle layers. If one layer falls apart a bit, simply use it as the second layer, and no one will ever know. You can even make a three-layered circular cake using a sheet cake simply by piecing scraps together for the second layer. 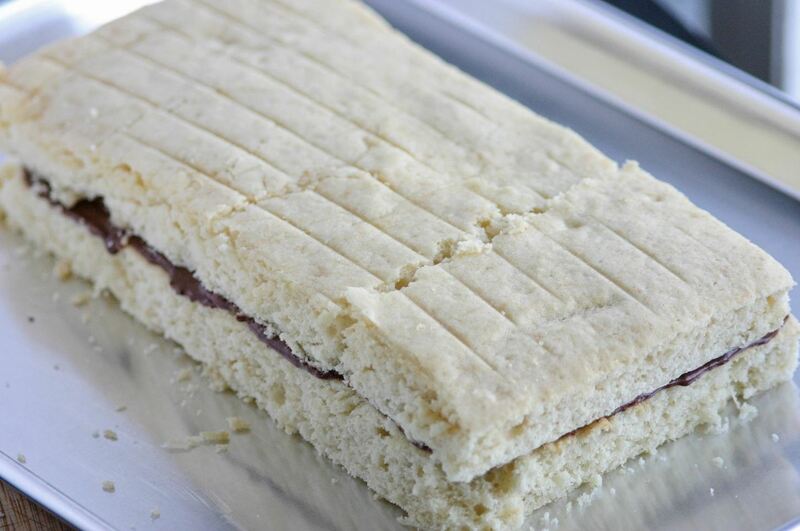 Before frosting each layer, soak it with a few tablespoons of milk. I add a touch of clear vanilla to the milk, for extra punch, but you could add any clear flavoring that complemented the flavor of your cake and frosting. Use a spoon to pour the milk all over each layer; the cake will immediately soak it up. This added liquid will help the cake stay very moist. Most cake recipes instruct you to slather the entire thing in frosting. In my opinion, this is often a mistake. Frosting each layer as well as the outside of the cake can result in a monotonous-looking dessert and a way-too-high frosting-to-cake ratio. When your cake tastes great, you don't need to hide it under a blanket of heavy frosting! Next time, try only frosting each layer and the top of the cake and leaving the sides naked. This will allow the flavor of your cake to shine through while still satisfying the need for a little textural variation and added sweetness. The only thing better than a great cake itself is the lavish praise you'll receive when you serve it. With these tricks, you can stop making good cakes, start making great ones, and get some much-deserved kudos for your elevated baking skills.